Pioneer Kimathi Street is located on Kimathi Street near to the Nation House and the New Stanley Hotel. It is a commercial building with offices and shops that vary from 250 – 2000 sq. feet. Each floor has a modern style kitchen/utility room. Two brand new lifts are available, serviced and maintained by professionals regularly. Two new generators are installed to ensure uninterrupted power supply. Security services and fire alarm backup are provided by specialists, to ensure that tenants are always secure. New security cameras with night vision technology are installed and placed in strategic areas. Additionally, to maximize security, walk-in scanners are installed at the ground floor entry level. Interior landscaping is provided on each floor to add beauty to the building and the building contains Modern organic artwork on each floor. To provide for natural light and ventilation a new 12 x 5-metre modern skylight design has been added to the building. The building is Fiber ready. 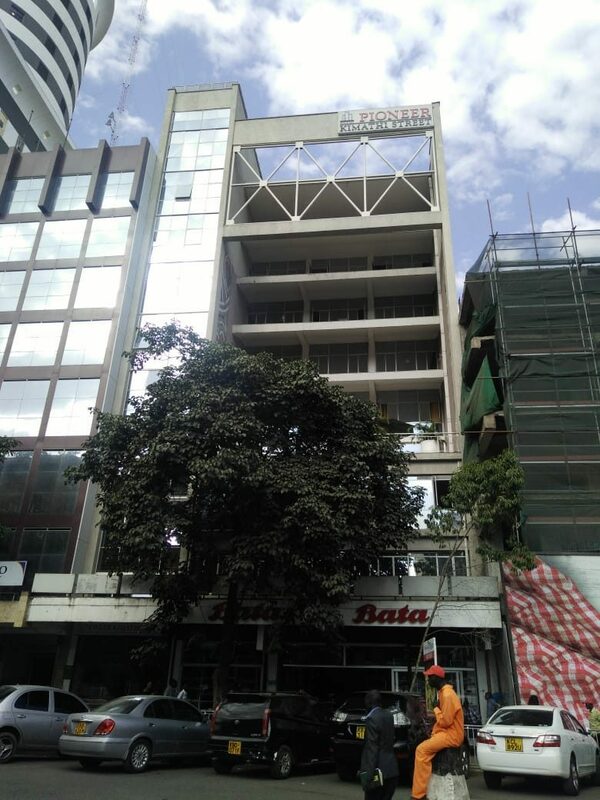 The property is currently fully occupied, having Bata Kenya as the anchor tenant on the ground floor.